Do you work to truly satisfy your customer’s wants and needs ? I am sure you would say you do, but do you know if you are successful ? You really do not know the answer to this question unless you are asking your customers their opinions. In order to improve or fix something, you have to know what it is that needs to be fixed. The #1 opinion that counts on this for a business is the opinions of the customers. 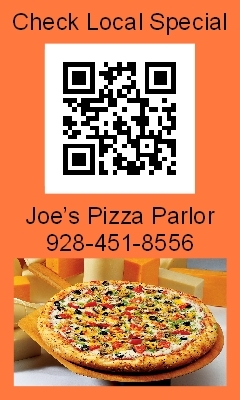 Customers that have Smart Phones can scan a QR code on a business card, postcard, opinion card, or what ever printed material you want to use. The QR code will open a web page in which the customer can rate your service and leave an opinion comment. This will allow you to have the opinions in electronic format for easier collection and use. The positive opinions can be used to improve and strengthen you online reputation. The negative opinions can be used for corrective measures to be taken. Collects customers opinion information for managing your business. Sets up a system for your business reputation management. Builds on your business image to use modern methods that show you care about your customers. Most small business owners are just too busy with the daily requirements of the work in running their this business to get around to implementing a customer satisfaction survey system. So, getting some outside help in setting up this type of system can offer some long term benefits for the business. At Bellrock Internet we are ready to assist. Give your local customers incentives to keep returning to your restaurant! A couple of local customers come in to your restaurant or cafe and take a look at your menu. Things look good, so they stay and order a meal. They have a good time and enjoy the food and beverages. Then they leave. A couple of local customers come in to your restaurant or cafe and take a look at your menu. Things look good, so they stay and order a meal. They have a good time and enjoy the food and beverages. While serving them you notice they have smart phones. You mention you have specials every week on Friday and Saturday and ask them if they would like to have a couple of refrigerator magnets which will connect their smart phones to the information on your specials. They say yes and thank you. Then they leave. Now which of the above stories gives the restaurant’s customers the more incentive to return to the restaurant on a regular basis ? Most all restaurants offer specials. How can you be more proactive in communicating with local customers to keep them returning. Why are you concerned about local customers ? They are the ones that have the ability to keep returning. You are targeting your specials towards local customers that have the ability of becoming repeated loyal returning customers. Compare this to just publishing newsprint ads of specials that most of the time are never viewed or are used by visiting customers that can only come it once since they are not local. You are also making use of a new marketing segment, the mobile smart phone user. Smart phones users are everywhere. Did you know there are more smart phone users accessing the internet today than desktop computer users ? Many of these smart phone users are passionate about their phones and love to use them. You will be just offering them another way to enjoy their passion of using their smart phone.